GTECH G2 has just released the most significant upgrade to its downloadable casino product ever. The new player-centric Casino 4.10 software includes seven new games, integrated networked games, an enhanced tournament engine, new multilingual capacity and an improved gaming management system. In November, Sportingbet and Gaming VC (which operates Casino Club), will be the first operators to update. New slot machine and video poker engines that are part of this comprehensive software update power the seven new games. Hells Bells is an IVT slot machine built on the new slot engine and a true Synot performer. Luxor Temple has an ancient Egyptian mythology theme, three jackpots and a bonus game. A street race theme, progressive jackpot and a final race in the bonus game make for Hot Pursuit. Players can double or quadruple their winnings on the new Spot of Luck Video Poker, Spielo video poker game. Rockin Fruits is a classic fruit theme with a bonus wheel and a pick ´n click game. Burning Ocean is another IVT slot with a jackpot and double up game. Rainbows and pots of gold await in the new Irish Magic video poker game. The new casino client is available in more than 20 different languages and supports the standard world currencies -- Dollar, Euro, and Pound Sterling -- or other currency on demand. Even with all the new features, the improved format of the new download casino has fewer files to be downloaded and validated. Casino 4.10 also allows smaller operators to benefit from increased liquidity by connecting to a games network. Networking brings more players to the game tables, leading to a more attrac­tive social community, and more compelling promotions, prizes and tournaments. Its flexible Gaming Management System back end has allowed GTECH G2 to aggregate content and supply it as a single package. A diverse range of content, sometimes utilizing disparate technologies, plugs into a single backend platform. 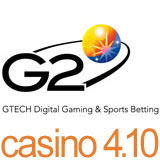 This system also allows GTECH G2 to present player data in a single aggregated form, an essential tool for operators looking to maximize their gaming revenues. The GTECH G2 Gaming Management System (GMS) gives operators maximum control and the ability to continually optimize their offering to cater to different players throughout their customer life cycles. It enables operators to present unique bonus offers, comps programs and in-game promotions and use free games to attract new players. It encourages responsible gaming by giving players the ability to set their own loss and wager limits. GTECH G2 is the igaming division of lottery industry giant, GTECH. It combines the software development and customer management expertise of Boss Media, Finsoft, Dynamite Idea and St Minver and operates the International Poker Network and International Bingo Network.